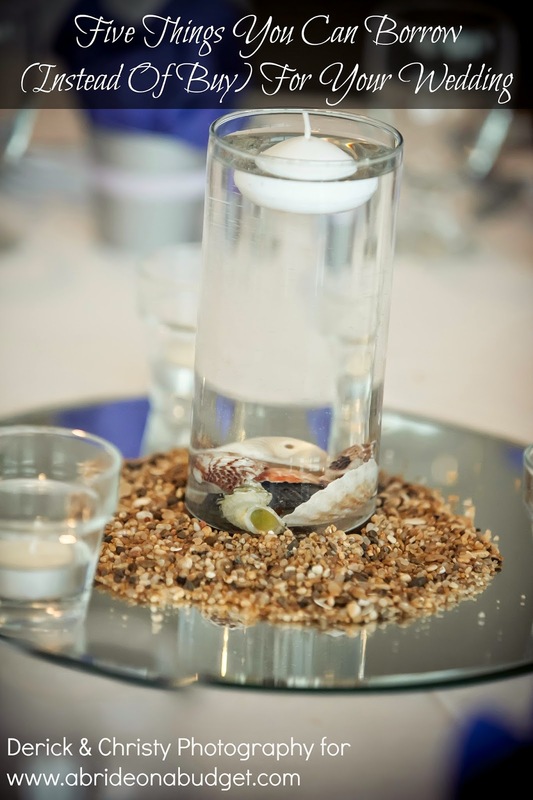 Before you go ahead and order flower petals for your flower girl to toss as she skips down the aisle, check with your venue to make sure that's actually allowed. Our church said it was a no go. That was fine for us because we actually didn't have a flower girl, but it was the first time I heard something like that. The priest said that they don't have anyone who was responsible for cleaning up the petals after the ceremony, so they just don't let you have them. No worries. There are alternatives. I put together a list of super cute wedding signs for flower girls and ring bearers to carry. 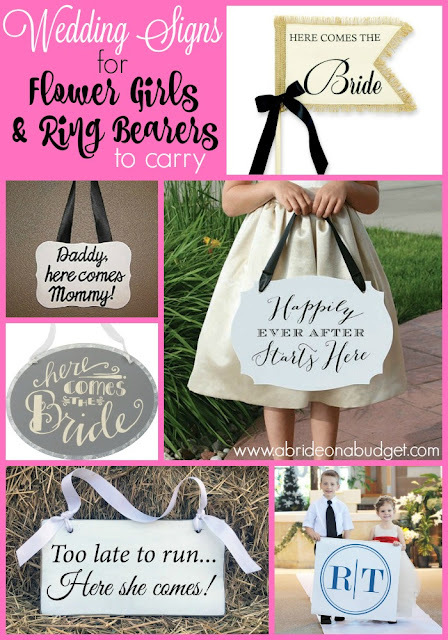 Yes, I included the ring bearers because, as you may remember from our ring bearer post, they don't actually carry the rings. 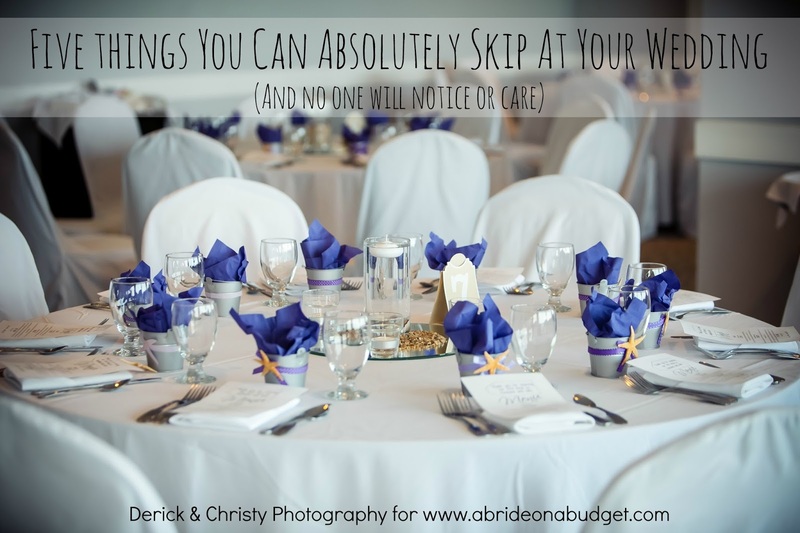 Weddings don't have to be so serious and rigid. 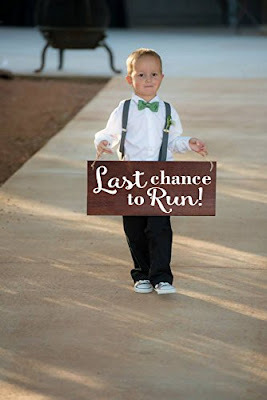 They can be light and fun ... just like this Last Chance To Run sign. It's a really funny sign for a runaway groom. Plus it makes for some funny photos too. If you and your fiance already have kids, you definitely will get adorable photos if you get your child(ren) to carry this Daddy, here comes Mommy! sign. Our friends had their daughters carry something similar and I just thought it was the sweetest thing. 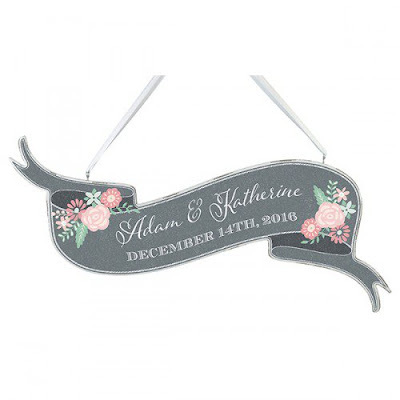 ... or you can get a personalized version with your names and wedding date. They're the same sign, but they come from different websites, depending on what you want. I would pick the non-personalized one because then you can lend it to a friend after. Purchase the non-personalized one here or the personalized one here. 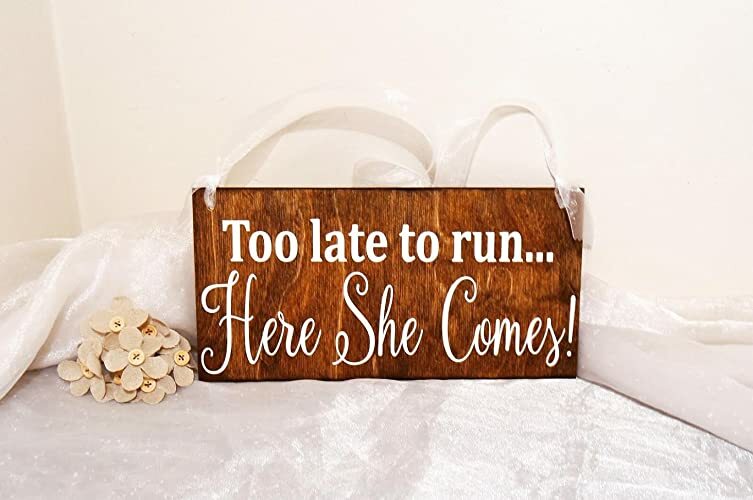 Here's the other funny sign on the list: Too Late To Run ... Here She Comes! 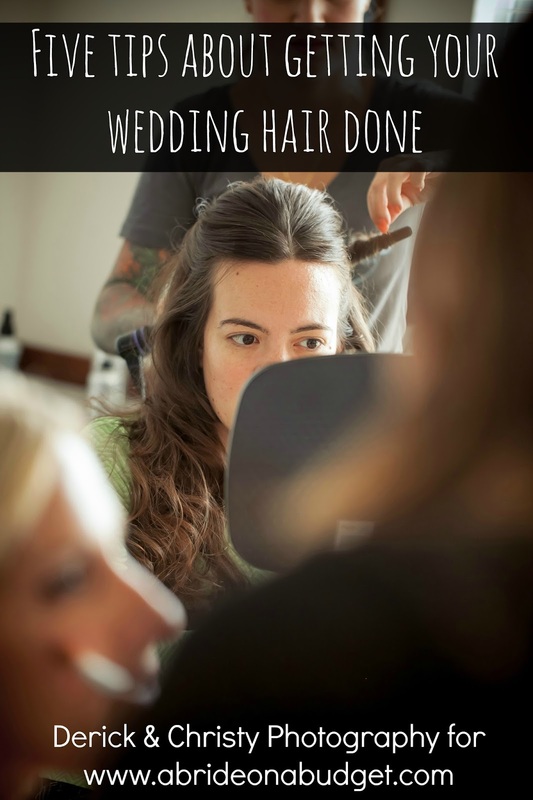 I can see this really working at a lot of weddings, especially ones where the bride was a little more forward about wanting to get married than the groom. 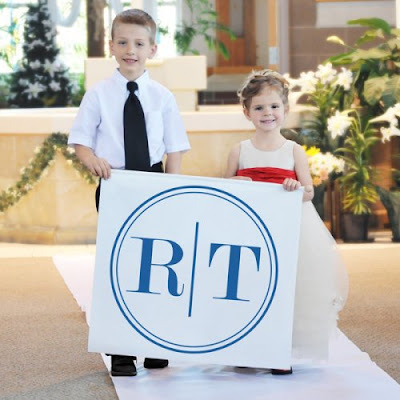 If your flower girl or ring bearer is small, pick up this Here Comes The Bride sign. Many of the reviews mention its petite size, so keep that in mind when you're looking at this tin sign. One reviewer mentioned that it fit perfectly on the wagon her flower girl was being pulled down the aisle in, so that should give you help with the sizing. I really love this Circle Monogram sign. I didn't change my last name, so it drives me crazy when every monogram has a shared letter for your last name. I understand that's common, but it's not everyone. So this monogram, where you just put the first letter of each of your first names, has a special place in my heart. 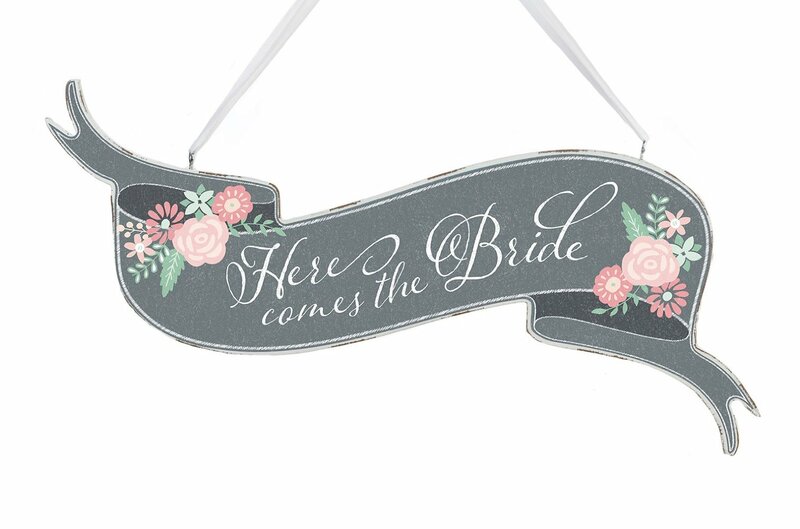 If you're having a pair of flower girls, a pair of ring bearers, or one of each, think about getting this Here Comes The Bride sign. You'll need one on each side to get this sign down the aisle. 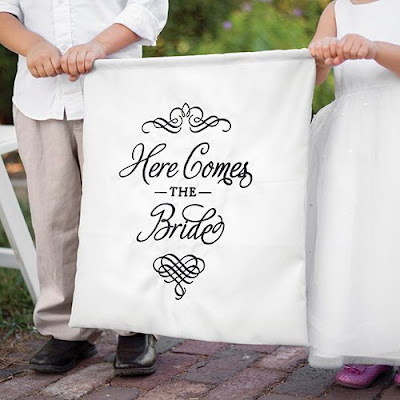 You can pick it up in a variety of colors, so you can have it match your wedding colors. Personally, though, I think black letters on a white background is the easiest to read though, so keep that in mind. 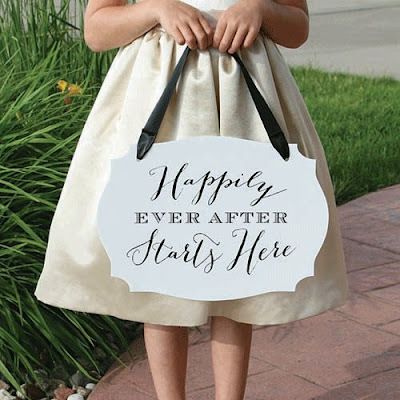 I saved my favorite for last, this Happily Ever After Start Here sign. I saw it and it just stopped my heart. It's so true. Your wedding is when that chapter of your love story starts, so this is just a beautiful and perfect sentiment. 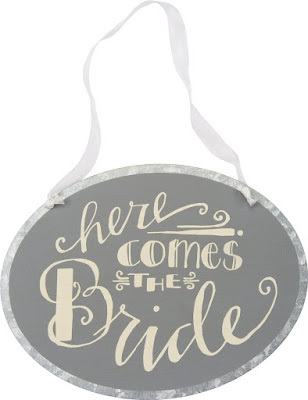 Plus, this would be so cute for you to hold in your wedding photos after the ceremony is over. BRIDAL BABBLE: Which of these wedding signs is your favorite?